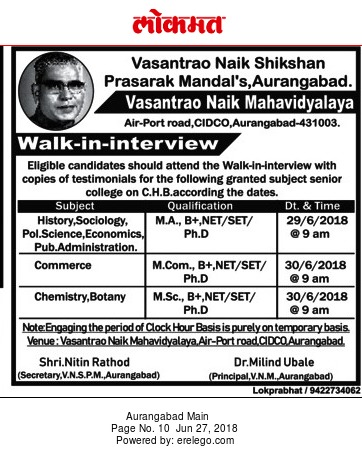 Vasantrao Naik Mahavidyalaya, Aurangabad has advertised in the LOKMAT newspaper for recruitment of Teaching Faculty jobs vacancies. Interested and eligible job aspirants are requested to walk-in on 29th and 30th June 2018. Check out further more details below. About College : Vasantrao Naik Shikshan Prasarak Mandal could not take up this enormous task without the help of army of teachers who had merit as well as social commitment. Most of the students came from weaker sections of the community, specially from scheduled castes and denotified tribes like Banjaras, Pardhis, Tadwis, Rajput Bhamta and others and were enrolled in “Earn and Learn” scheme, as they had hardly any money to pay for the facilities.